Practical life activities include daily living tasks such as buttoning, snapping, tying, shining shoes, sweeping and polishing. Children also learn the forms of grace and courtesy such as returning materials neatly to the shelves, pushing in chairs, and not interrupting others. 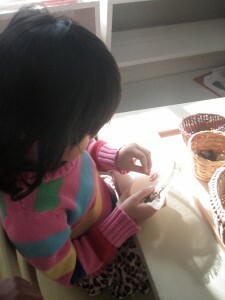 To the children, these meaningful tasks involve caring for oneself, other people and the environment. 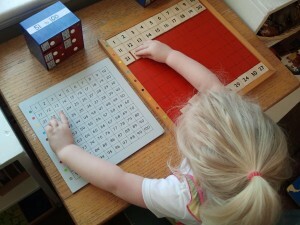 They also help the children concentrate, expand their attention span, and gain independence. Practical Life exercises help children develop an inner order and smooth rhythm to gross and fine motor skills. They also help to establish an easily defined method of process. 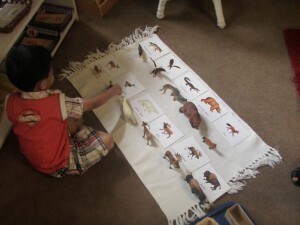 Children learn to recognize the beginning, middle and end of an activity. Sensorial materials are intended to help the child relate, order, explore, and classify the sense impressions they had before coming to school. The materials are designed to aid in discriminating form, shape, size, color, sound, and touch. Some Montessori materials, such as the binomial cube, are concrete representations of mathematical concepts that appear in later schooling. Language is woven into all parts of the program. 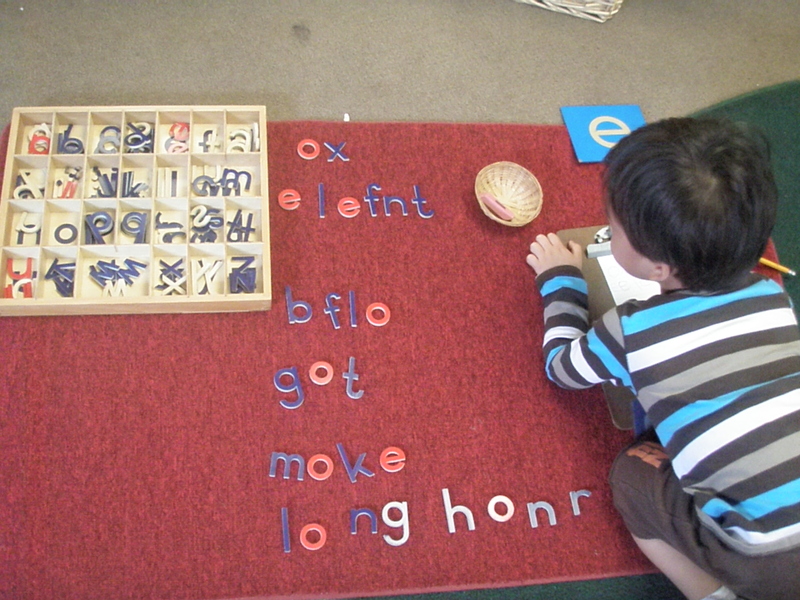 The child learns that words are made of sounds. They learn that each sound has a symbol. 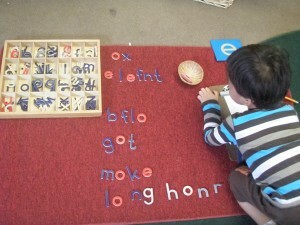 Knowing the sound and symbol for each letter of the alphabet, they begin to build words. Stories, poems, plays, and ordinary conversation are important in the environment. The aim is to increase the child’s knowledge, organization of thought, confidence and ability to express and use their mind through the use of the reading, grammar and writing exercises found in the Montessori language program. 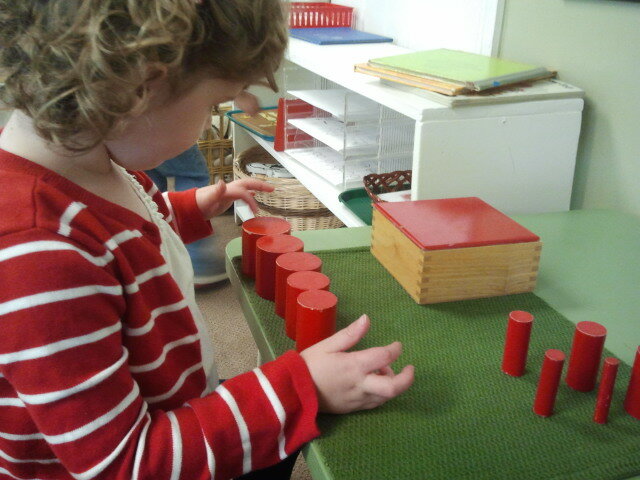 Dr. Montessori observed human tendencies to abstract, investigate, calculate, measure, imagine and create. 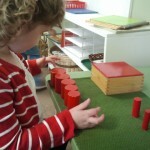 If allowed to develop these tendencies through manipulating concrete materials, the child moves easily on to abstraction and a love for mathematics. The early materials teach the very basics such as quantity and symbols. Later the decimal system (bead bar units of tens, hundreds, thousands) is brought to the child along with basic arithmetic processes. Cultural materials include basic nomenclature and introduction for the biologies (zoology and botany), geographies, (political, cultural and physical), and invitations to various science experiments.